The suspension system is a major part of the structure of any vehicle and it is made up of a complex series of components including shock absorbers, springs and linkages. The suspension system works to reduce vibrations and absorb road impact for a smooth and comfortable driving experience. It also maximises friction between the tyres and the road to provide steering stability and good handling, enabling the driver to retain control. Without suspension to absorb the forces of the road, tyres would not be able to retain contact with the surface of the road, which is essential for handling, steering and braking. In addition, if the suspension system did not absorb forces from the road, this could cause damage to the chassis of your vehicle. The Constant Velocity Joint is covered by a protective rubber component which can wear over time. If it does break, this leaves the joint exposed to damage. Diagnosing problems with car suspension is difficult as some signs can often indicate an issue with a different vehicle component. Never ignore any of the following symptoms as driving on damaged suspension could cause further damage! Problems with your suspension system can be difficult to identify due to gradual wear over time. We would recommend having your suspension checked every 12 months or 12,000 miles, if it is not checked during your annual car service or if you have noticed any of the signs listed above. 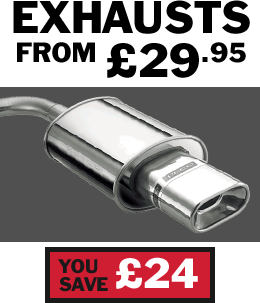 Visit your local Setyres centre for a FREE Exhaust Health Check. We also offer exhaust repairs and replacement for any make and model of car if necessary. All parts and labour come fully guaranteed.